With one week left until Election Day, Virginia's Democratic gubernatorial candidate Terry McAuliffe has a double digit lead over his Republican counterpart, a new Washington Post/Abt SRBI poll found. 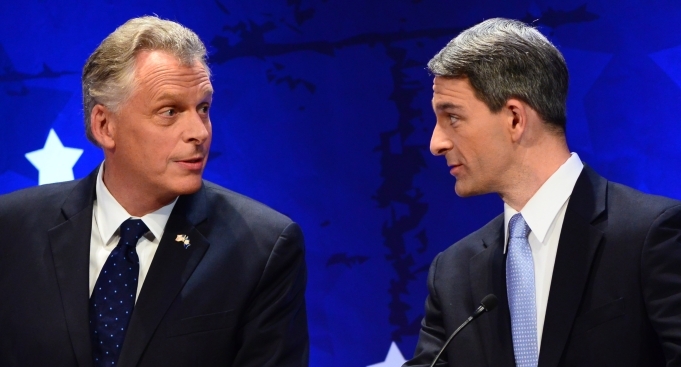 Fifty-one percent of likely voters favored McAuliffe over Ken Cuccinelli in the race for governor, while 39 percent favored Cuccinelli. Eight percent of those polled supported Libertarian Robert Sarvis. Cuccinelli, the tea party-backed attorney general, has seen McAuliffe's lead grow in recent weeks as the Republican brand was damaged in the wake of the partial government shutdown in Washington and an all-out negative shift in wall-to-wall campaign advertisements. The poll also revealed a large gender gap amongst voters, with 58 percent of women favoring McAuliffe while the candidates run more evenly amongst men with 45 percent of men supporting Cuccinelli. According to the Washington Post, McAuliffe's lead could break a streak in the commonwealth's gubernatorial races -- the party in the White House has lost the governor's race in Virginia in the nine most recent elections. But McAuliffe's lead is not a reflection of outright support for him. Sixty-four percent of those polled said they are simply voting against Cuccinelli. In the last days of their campaign, the candidates have taken to the campaign trail to do some last minute stumping with big names. Monday night, GOP faithful packed a reception hall in Fairfax County to show support for Cuccinelli and to hear from Tea Party favorite Sen. Rand Paul. Meanwhile, Democrats gathered to hear from McAuliffe -- and his friend, former President Bill Clinton.